Mercedes C-Class C220d AMG Line Premium 5dr 9G-Tronic 2019 Review | What Car? What Car? will save you at least £4,380, but our approved dealers could save you even more. 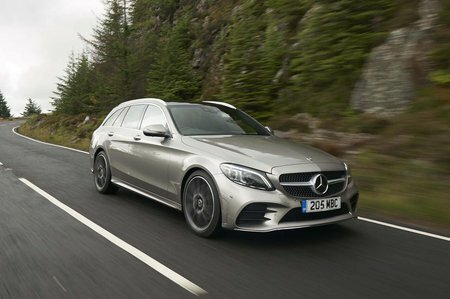 The Mercedes-Benz C-Class Estate offers plenty of style and badge presence, but there are bigger, more practical and cheaper premium alternatives, such as the Audi A4 Avant and Volvo V60, which deliver better all-round packages. Based on Sport, this trim brings stiffer suspension, even sportier seats, more aggressive bodystyling and even larger wheels. You also get some smart open-grain wood inserts that rather lift the interior. But, again, it’s costly to buy. This 191bhp diesel engine is our favourite in the range. It delivers its best performance low down, right where you need it, yet also returns impressive fuel efficiency. True, it’s quite noisy when it’s pushed hard, but it settles down when you’re just cruising along.